As of the moment, 3DS XL owners have no option of extending their battery life other down bringing a portable charger like a Power Bank or USB charger as Nyko’s Power Pak+ for the larger 3DS model to have mothballed. Fortunately, JTT Products seems to see the market for extending the 3DS XL’s longetivity and is looking to market their battery pack that extends the XL’s 8 hour battery life to 21 hours. Yep, you read that right, 21 hours is JTT’s promise and they’ve got a video to test this claim. The 3DS with the extended battery runs out 3 hours short of a 24 hour run. The rating for JTT’s battery pack is 5,800mAh and couple that with the Nintendo 3DS XL’s 1,750mAh battery you get the massive boost that you see in the video. Now for the next most important part, the price. 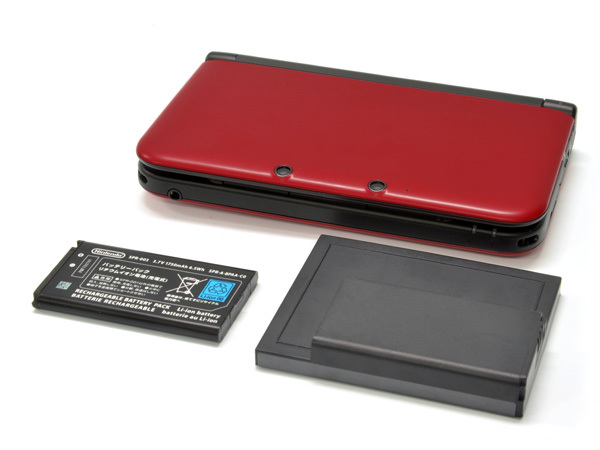 Unfortunately, JTT’s 3DS XL battery pack costs 9,980 yen (roughly $110) and will add a bit of heft, lessening your console’s already questionable portability — for some, I personally have no problems pocketing the 3DS XL. For that price you’re better off buying a Power Bank with 6,000 mAh for a lot less while remaining Circle Pad Pro compatible.